At the start of July last year, a few weeks after the unexpected loss of Yori, we had to say goodbye to Rommie. She was the second-longest-lived of all our ratties, making it to the grand old age of two years and eight months. At some point, we’re not sure when as it was probably masked by Yori’s propensity for bleeding randomly, Rommie started to have a small amount of blood in her urine. We never found the cause of it, neither antibiotics nor steroids cured the underlying problem, and she was too old to even consider exploratory surgery, so we lived with it. Just another side effect of getting old. And as with all ratties who don’t succumb to a specific medical problem, she got older, she lost weight, and eventually started to look like life wasn’t fun any more. And that’s the point at which you make the decision to stop before life becomes painful. 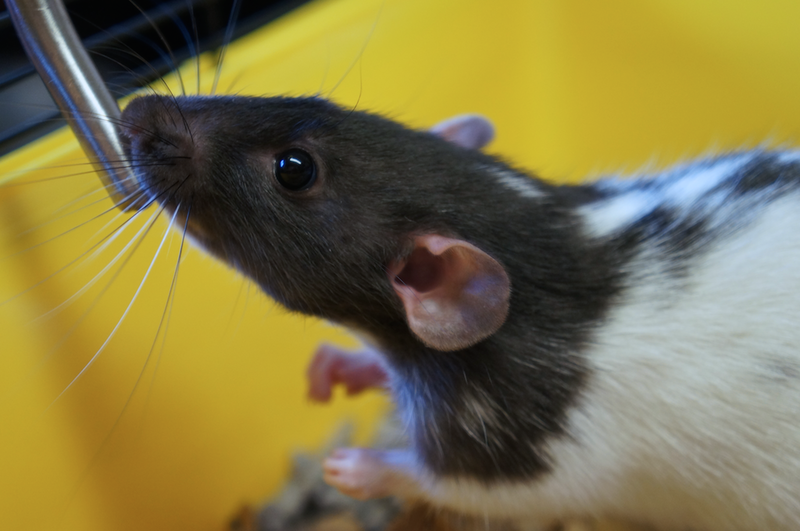 Rommie was one of the prettiest ratties, with a lovely splotchy tummy to match her splotchy back. She loved her food and turned into a bit of a squishy fat rat (though never excessively so), and would even put up with the indignity of having her tummy scritched as long as there was food to distract her. 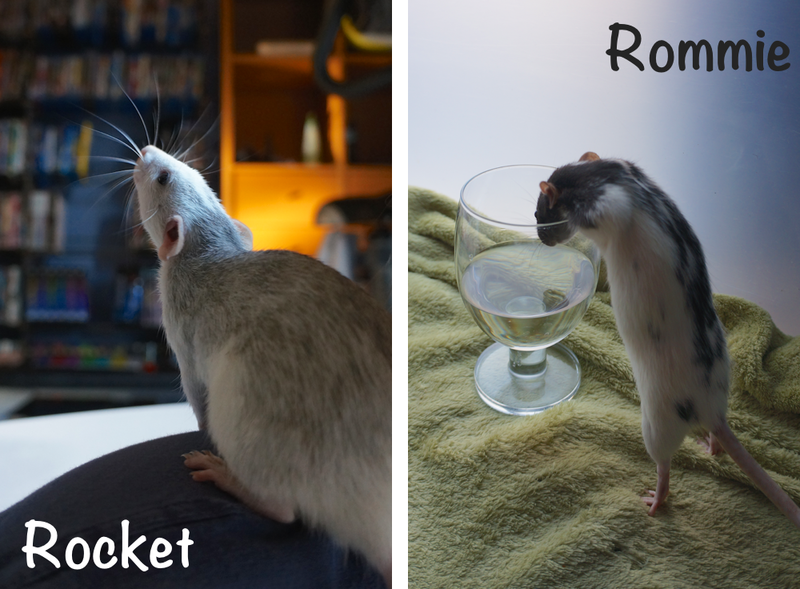 So, Rocket and Rommie have been with us for a month now and they are settling in nicely. As expected, they need some extra time and attention to get them fully socialised — after all, when we brought them home they were more than twice the age the other girls were when they arrived. Rocket — aka Rocket McBitey — requires the most patience; she’s easy enough to scoop up and you can even hold her, but she has a bad habit of trying to get her opinion across with her teeth. It’s mostly her being territorial in the cage, though she does occasionally nip when she’s out as well. I suspect that, especially given the speed at which she moved when we went to collect her, she hadn’t been handled much and had learned that the occasional nip would discourage people from even trying. But not me. I don’t back off. She will eventually learn that biting doesn’t work. Thankfully she doesn’t come close to breaking the skin. And she’s so cute and adorable that it’s hard to get annoyed with her. Rommie is altogether more outgoing. The main problem with her is trying to hold her as she is exceptionally wriggly. And hyperactive. And a determined climber. Her latest trick is to try and climb up the anglepoise lamp, which is ridiculously funny to watch because she’s so persistent about it. I had to put a stop to it when she was standing on the back of the sofa, eyeing up the lamp — you could see her little ratty brain trying to work out whether she could jump over to it. She will climb anything she can: furniture, the open cage doors (she is on a mission to see what is higher than the top of the cage), and people (Codepope stood up from his chair the other day only to discover that she was already clinging to his leg). I dread her making a break for it and discovering the curtains! The new girls now have names! After much pondering we’ve decided to abandon the idea of trying to find a female SF name that easily splits into two nice ratty names à la River Song. The splodgy black hooded is Rommie. We got as far as “female ship’s avatar” as a potential theme and Rommie (from Andromeda) seemed to suit her. Unfortunately I wasn’t taken by the other options we came up with — Holly (Red Dwarf) or Moya (Farscape) — for the grey roan, so she is Rocket, mainly because of the speed at which she moved when we first tried to get her out of her cage to come home with us. At first I assumed that Rommie was the most sociable as she was the easiest to pick up, but I soon realised that that was only because she was freezing in place at the horror of someone having the temerity to try and lift her off the ground. She is a brave and curious creature who will now happily climb onto me, but only on her terms. She is lightning quick and, even if you do managed to pick her up, she can extricate herself at incredible speed and launch herself off in unpredictable directions. Once on you, she will eventually try to get away by digging — between arm and body or through legs — and will squeak her annoyance if she isn’t immediately successful. She is definitely “most likely to escape”, but we are making progress. Rocket is a gorgeous blazed roan with the prettiest face. I do hope she doesn’t lose all of her colouring. She is much easier to pick up than Rommie and will tolerate being held for a couple of seconds before trying to wriggle free. Her favourite thing is to climb, mainly, it seems, with the aim of finding a way out of wherever she is and go exploring. She has yet to learn that fingers are not food. She has the potential to be an awesome shoulder rat. Or shoulder-mounted Rocket. We haven’t yet tested her suitably as a pocket Rocket.